Of all the bizarre stunts, theories, and inventions that have populated the short history of humankind's foray into the skies, Amelia Earhart conspiracy theories might be the most bizarre of all. OK, the Pogo was pretty bizarre, too, but Amelia Earhart conspiracy theories are often downright stupid to boot. Let's get this straight. Amelia Earhart and her navigator Fred Noonan crashed and died. The end. Except that like all unsolved mysteries, there are plenty of people who don't buy that the simplest explanation is probably the truth. Conspiracies are much more fun. Let's start with perhaps the most ridiculous: She was rescued Hollywood style, at the last second, just before the Lockheed Electra plunged into the Pacific Ocean. Her rescuers, according to the New Dimension blog? A race of benevolent people called the Agarthians, who live inside the Earth, which by the way is hollow. How did they do it? Teleportation. And guess what, Earhart is still living with them inside the hollow Earth, and she's also eternally young, which is super cool and probably also the reason why she decided to never stick her head out of the hollow Earth just to say, "Psst, hey it's me Amelia and I'm actually not dead!" Because maybe she'll instantly age 80 years if she leaves her little hidey-hole, and no one wants that. Evidently Earhart has been quite enjoying her new role as a Hollow Earth greeter, which is exactly the same as a Wal-Mart greeter only without the blue vest. "Welcome to the Hollow Earth, how may I help you?" Sounds like a great use of the famous aviator's time. But hey, she's immortal so maybe she'll be up for a promotion in a few hundred years. Ridiculous theory the second: Amelia Earhart was abducted by aliens. Because you know, the most logical explanation for pretty much every disappearance ever is alien abduction, given that crashing into the ocean just seems so much less likely. Now depending whom you ask, there are lots of reasons why the aliens might have wanted Earhart. Here's a good one from "Unveiled Secrets and Messages of Light": aliens took her to another planet, cryogenically froze her, then later on defrosted her for "biological exams," and then that somehow led to her founding an entire off-world civilization of freckled alien aviators. Obviously. Still, the alien abduction theory was totally confirmed in Season 2, Episode 1, of Star Trek Voyager, when the crew found Earhart and Noonan stranded on a planet in the Delta quadrant, where they'd be left by their alien abductors. And if Star Trek says it was true, then it totally was. 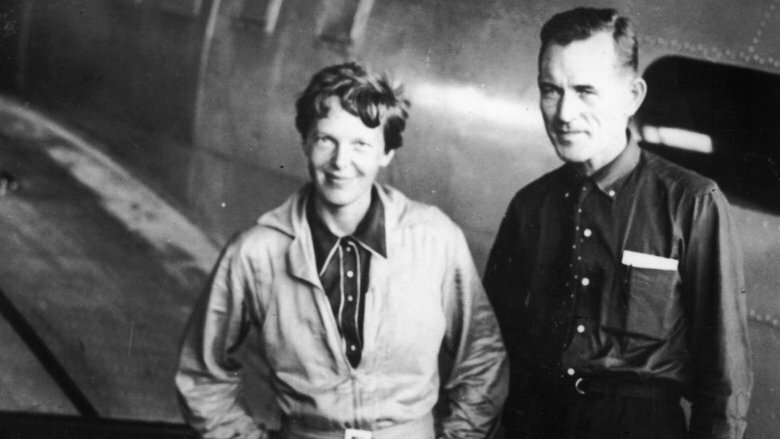 So in this story, Amelia Earhart throws away her whole ambition to be the first woman to fly around the world because she thought Fred Noonan (pictured above, with Earhart) was super hot. What about the fact that Earhart and Noonan both seem to have been happy in their respective marriages? According to The International Group for Historic Aircraft Recovery (TIGHAR), Noonan got married the day before Earhart named him as her navigator, and Earhart herself had been married for six years to publisher George Palmer Putnam. Well, even if we leave that aside entirely, there isn't any evidence at all to suggest the story is true, and it seems rather an insult to think that Earhart was willing to sacrifice her trip around the world because Fred Noonan was such a dreamboat. Like so many other stories that gain life even though there's clearly no truth to them whatsoever, this one seems to have been based almost entirely on the subplot of the 1943 movie Flight For Freedom. Apparently people saw it, went "That sounds plausible," and a conspiracy theory was born. If only Earhart was alive today to do the facepalm, so we wouldn't have to do it for her. In what is perhaps the stupidest of all the Amelia Earhart theories, this one — as reported by History — has her crash-landing on an island in the Pacific, leaving her airplane … somewhere (which must have been hidden beneath coconut fronds or something since it was never seen again), deciding that she liked the Pacific islands too much to leave, getting a nursing degree without anyone noticing, and eventually ending up on Guadalcanal. As stupid as this theory is, it's actually one of the more understandable. The "Amelia Earhart" in the story was likely a nurse named Merle Farland who was evacuated to Guadalcanal in 1943, where she was one woman among 30,000 soldiers. And because she kind of, sort of, looked like Amelia Earhart and had messy hair or something, and because half the soldiers had malaria and were hallucinating, yet another rumor of Earhart's health and life was born and grew legs. What's particularly amusing about this one is that it still makes the list of plausible theories even though it's pretty clear exactly why the rumor started and how untrue it actually was. But let no man come between truth and a hallucination. There's nothing like a little post-mortem slander to round out a list of theories, so here's one: Fred Noonan was an alcoholic, and he got drunk and passed out mid-flight, or he got drunk and pointed the plane toward Antarctica, or he got drunk and wrestled the controls away from Earhart and did a few doughnuts in the sky before plunging the Electra into the sea, or possibly he just got drunk and barfed all over the instrument panel, and Earhart said, "Eww, I am so not touching that," and then they died. 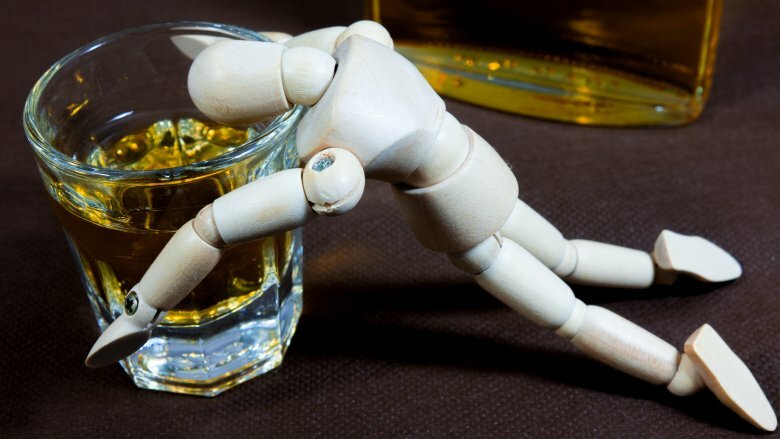 Whatever the outcome of Noonan being drunk in the air might have been, most everyone can agree that a drunk navigator would have been a bad thing, except for the part where there really isn't any evidence that Noonan was a drunk in general or drunk in particular on the last day of the voyage. 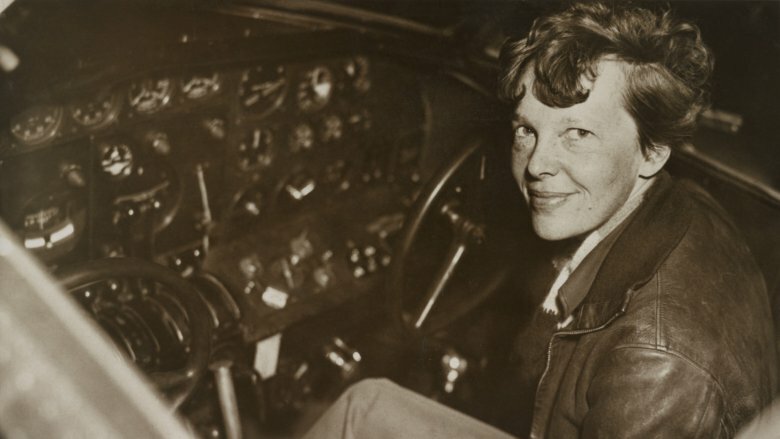 In the book Amelia Earhart's Shoes: Is the Mystery Solved? we're told that there's film of Noonan and Earhart boarding the Electra that morning, where Noonan deftly hops up on the wing and then turns to help Earhart do the same, which is not really consistent with the capabilities of someone who is fall-down drunk or hungover. So unless he got wasted in the air — which again doesn't give Earhart much credit because window plus 10,000 feet equals easy way to dispose of alcoholic navigator's whiskey — the drunk theory is just not very plausible. In what is perhaps the most horrifying of all Amelia Earhart theories, in this story that was rather insensitively spread by the New York Post, Earhart and Noonan crash-land on the tiny, remote island of Nikumaroro and are eaten by giant coconut crabs. Now, if you aren't already familiar with the coconut crab, here's what you need to know: Coconut crabs are terrifying. Coconut crabs are so terrifying that Godzilla and the smoke monster from Lost have formed a support group to help them deal with their totally rational fear of coconut crabs. 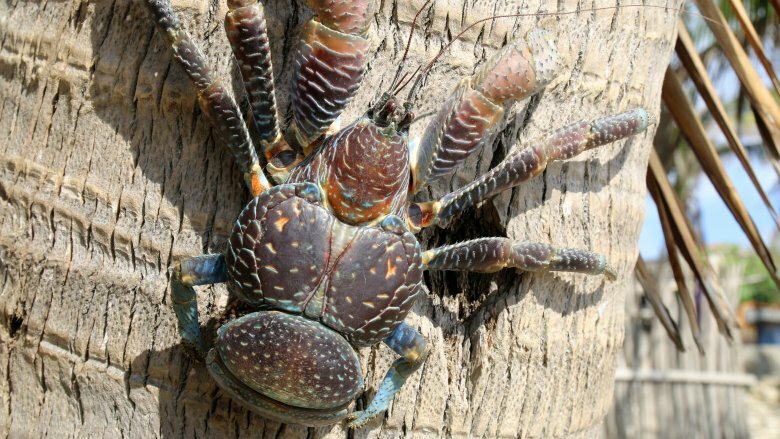 If you've ever had nightmares in which you were attacked by giant spiders, those weren't actually spiders, they were coconut crabs. Coconut crabs can grow to be 3 feet long — the size of a small dog — and the force in their claws is roughly equivalent to the force in a lion's jaws. Researchers once left a pig carcass lying around just to see what the coconut crabs would do to it, and they ate it. And scattered the bones. You don't have to go a long way from there to figure out that if coconut crabs happened upon a dead or dying Amelia Earhart, they'd have probably done exactly the same thing. Thanks for the sleepless nights, New York Post. Because it's way too logical to think that Earhart's plane might have just run out of gas, here's a much more likely explanation: Earhart was actually a spy, and she disappeared because the Japanese shot her down over the Marshall Islands, and the U.S. government never told us what happened to her because of some vague concerns about a sensitive diplomatic situation, which was for some reason really sensitive four whole years before World War II and is still just as sensitive more than 70 years after it. Anyway, there are a few choose-your-own-ending style conclusions to this particular story — according to The Telegraph, one of the prevailing theories is that Noonan was executed as a spy and Earhart died from dysentery. One of the shocking pieces of evidence used to support the Earhart-was-a-spy story is a photograph of a bunch of people standing around on a dock in the Marshall Islands, two of which are supposed to be Earhart and Noonan. The photo was featured in the History Channel "documentary" Amelia Earhart: The Lost Evidence as purported proof that Earhart and Noonan were alive and well at the time the photo was taken, but it was actually taken two years before they disappeared. But you know, there's that whole alien abduction thing, so time travel. Another favorite ending to the Marshall Islands spy story is that Earhart became a "Tokyo Rose," an English-speaking Japanese radio broadcaster who spread anti-American propaganda during the war. Now, this theory was pretty solidly refuted by Earhart's husband in 1944, who said he would "stake his life" that the Tokyo Rose voice he heard didn't belong to his wife, but never let solid refutation get in the way of a good conspiracy theory. Because spy theories never get old, here's another one: According to TIGHAR, in 1970, Joe Klaas' book Amelia Earhart Lives! made the extraordinary claim that Earhart not only survived the crash, but was alive and well and living in New Jersey. What's more, Klaas knew her new name and where to find her. In this story, Earhart landed in the Marshall Islands, was captured by the Japanese, blah, blah, blah, etc., etc., and then was rescued by U.S. forces at the end of World War II. Instead of smiling and waving at her fans as they welcomed her home, she decided to change her name to Irene Bolam and get a job as a banker. Unsurprisingly, this kind of upset the real Irene Bolam, who responded exactly how any private person would when publicly accused of being a long-dead celebrity — by suing Klaas and his publisher. The book was withdrawn from the market, but unlike Earhart herself the theory refused to disappear. Bolam died in 1982, leaving others to raise the idea without fear of retribution, and in 2003 yet another book (Amelia Earhart Survived, by Rollin Reineck) repeated the accusation. And unless Bolam's family decides to clear the air with DNA evidence, it's not likely that this theory is ever going to go away, even though the alien abduction theory and the one about the hollow Earth people are admittedly a lot more plausible. And now we've arrived at the boring theories, which are also probably the more likely of all of them. Yes, as the eternally boring Occam's razor tells us, "The simplest answer is most often correct," which really tells us more about how boring Occam was than about what happened to Amelia Earhart, but that's life. The Papua New Guinea theory says the plane crash-landed on the island of New Britain, where it was discovered in 1945 by a group of Australian soldiers. According to Mental Floss, the soldiers reported that the aircraft they discovered had similar engines to the Lockheed Electra, and also shared its construction number (C/N 1055). Evidently there is also a patrol map that could potentially lead interested parties right to the wreck, but it is "safeguarded" by the widow of one of the patrol men, sort of like how Fluffy the three-headed dog safeguards the Sorcerer's Stone. 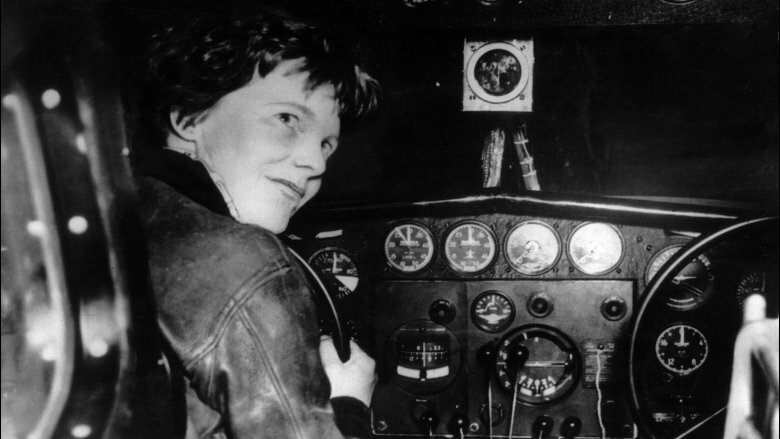 How did Amelia Earhart end up hundreds of miles off course on the island of New Britain? Proponents of this theory say she couldn't find the island she was supposed to land on so she turned around, which seems ridiculous given that she was low on fuel, but hey — let's just turn this theory into another totally crazy one and say that the Agarthians beamed her plane to New Britain shortly after teleporting her into the hollow Earth, thus not only saving her life but also giving us a fabulous mystery to ponder. 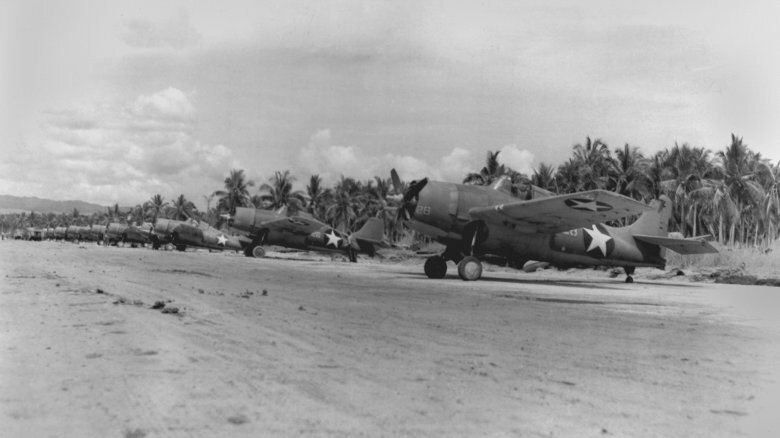 Another one of the more probable theories is this one: According to National Geographic, Earhart and Noonan crashed on or near the remote island of Nikumaroro and then didn't get eaten by coconut crabs but instead lived out their lives as castaways, like Tom Hanks only without the sentient volleyball. In 1940, a British official visited Nikumaroro and reported finding human bones under a tree. The bones were recovered and sent to Fiji, where they were lost, which is what happens every time someone finds evidence that could either prove or disprove an important theory. This raises the question as to why exactly scientists keep hiring lab assistants who misplace important pieces of evidence, but whatever. Even without the bones, the castaway theory is plausible enough that TIGHAR along with the National Geographic Society financed an expedition to the island with four bone-sniffing dogs in the hope of finally solving the mystery. Along with the bones, there were a bunch of other tantalizing bits of evidence found on Nikumaroro, such as the remains of shoes, a box that once contained a navigation device, and a jar of anti-freckle cream, a significant clue since Earhart was known to dislike her freckled complexion. In July 2017, the bone-sniffing dogs apparently did hit on the fabled tree as a place where there had once been human remains, but there's no word yet as to whether researchers will actually find DNA in the soil they collected. And finally, a theory that really isn't bizarre at all. In this story — which incidentally is also the official U.S. position — National Geographic says Earhart and Noonan ran out of gas and crashed into the ocean. 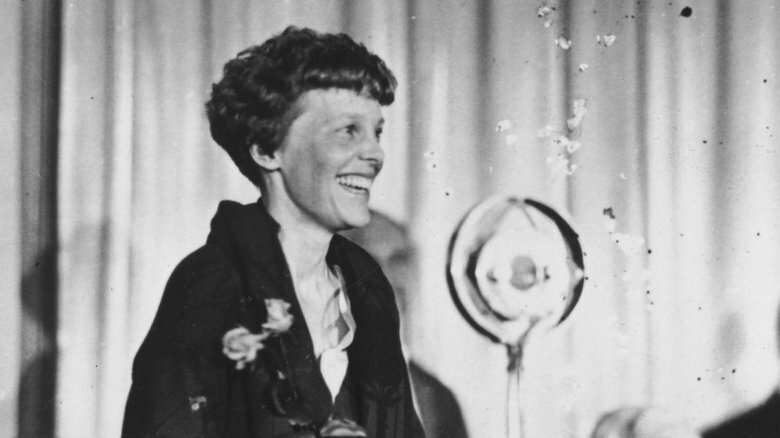 Sadly, evidence supports the theory in that Earhart was planning to land on Howland Island, radioed ahead to say that she thought she was close but was running low on gas and couldn't find the island, and then vanished shortly thereafter. In 2003, a deep-ocean research company embarked on a couple of high-tech expeditions to Howland Island, but found nothing. A 2009 expedition by the Waitt Institute for Discovery also searched the area and afterward trumpeted its great success of having eliminated "thousands of square miles from future search efforts," which is pretty dang optimistic but is really just another way of admitting that they still have no idea what happened to Amelia Earhart. The only thing that's really clear at this point is that the only way to end all the crazy theories, tall-tales, and speculative rumors is actually finding Amelia Earhart. Since the truth will almost certainly be way more boring than fiction, perhaps it's best if the famous aviator and her navigator just remain unfound.